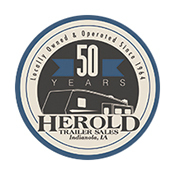 Herold Trailer Sales , locally owned and serving Central Iowa since 1964, is located on Hwy 92 West in Indianola. Herold Trailer Sales is an authorized Bighorn, Big Horn Traveler, Coachmen Apex, Aspen Trail, Shasta Revere, Shasta Oasis, Kodiak, East to West, Wildcat dealership in Indianola, IA. Along with a large selection of new models, Herold Trailer Sales carries a wide variety of pre-owned models. Herold Trailer Sales provides superior customer service and has an entire team that consists of professional sales members, finance experts, service technicians, and a knowledgeable parts and accessories staff to support you. We pride ourselves on having well-trained experts that strive for customer satisfaction. Come in and visit our friendly, reliable, and experienced staff, or call us at 515.961.7405. Our service department has over 70 years combined technician experience, and we are ready to help you with all of your service needs including winterization, complete restoration, and we do insurance work estimates. We have a large inventory of parts in stock, or you may take advantage of ordering parts and accessories online or by phone at 515-961-7405. Let us help you with all your camping needs. Please stop in and check us out. Remember, we are , not Harold's or Harold Trailer Sales!